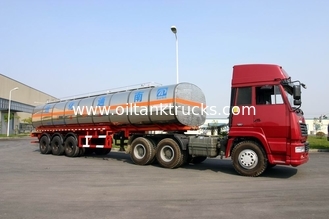 The logistic vehicle series mainly included Pressured and Non-pressured Tank Transportation vehicles. Normally for transport the gasoline, light diesel oil, petroleum and other non-corresive fuel properties, rarely impact the damage for other components, widely used in various transportation units, gas stations and other logistic industries. Sophisticated technique: Main parts of the trailer is processed with advanced equipment. The longitudinal beam is welded by a wholly automatic tracking submerged welding machine; Almost the steel spare parts are treated by shot blast before the assembling, which can greatly increase the adhesion of the paint. Frame: The frame is manufacture by a structure, which are made of high strength steel. This design reasonably to get a balanced consideration of the intensity, rigidity and toughness, advantages of low tare weight, heavy loading mass, not easy to be distorted. Axles: The axle can be selected in different famous brand of BPW and SAF, KIC, FUWA ect. domestic and overseas. Also, the ABS system can be optional with Haldex and WABCO etc., can be greatly increase the stability and safety. Suspension system: Mechanical suspension and air suspension series optional.a. 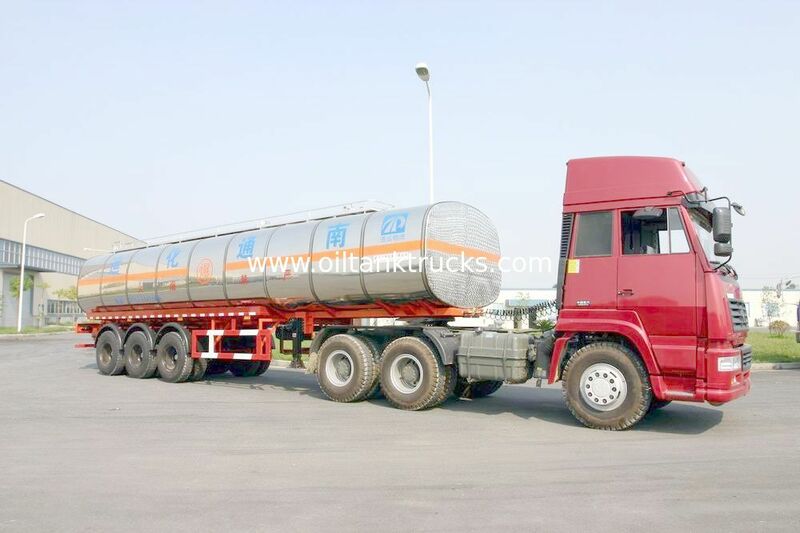 Mechanical suspension series: It used tandem and balance construction, have high strength and strong impacting resistance, evenly distribute the axle load into each axles. High strength material keep the service life much longer and efficient buffering, simple maintenance, easy replacement for the wearing parts.b. Air suspension system: Optional BPW & SAF. More shocking proof which combinated with lifting and steering axles. Brake system: Much more safety and reliability on dual-loop air brake system.